Categorizing the start of this month as a ‘tumultuous’ one for European politics is like saying the ancient Greek hero Ulysses had a ‘problematic’ trip home. 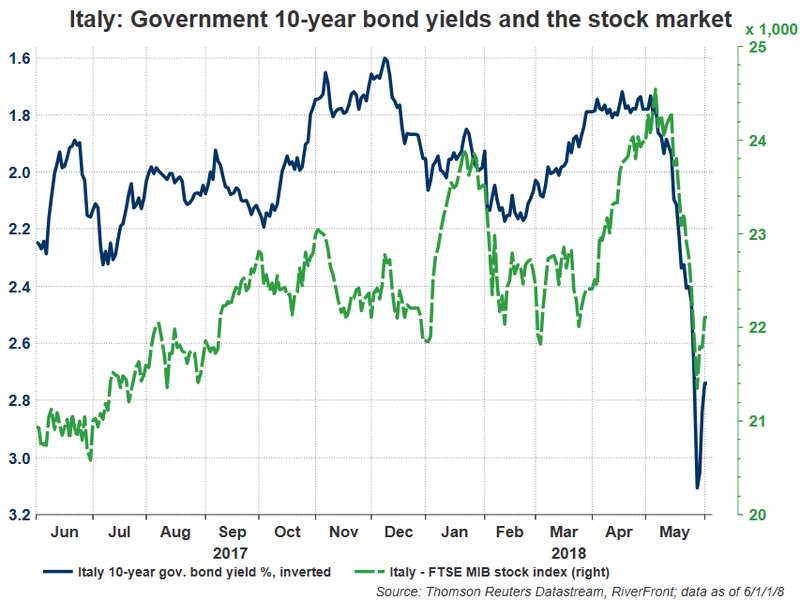 Italian bond yields had a wild ride early last week (see chart below) when the shaky political coalition between two Euroskeptic Italian parties fractured after Italian President Sergio Matterella denied the coalition’s pick for economic minister. Charts shown for illustrative purposes only. Past performance is no guarantee of future results. Not indicative of RiverFront portfolio performance. *The Index consists of the 40 most liquid and capitalized stocks listed on the Borsa Italiana. In the FTSE MIB Index foreign shares are eligible for inclusion. Secondary lines are not eligible for inclusion. The calculation and methodology is unchanged from S&P MIB Index. Markets panicked as investors envisaged fresh elections in the Fall. Many feared this election would become a de facto referendum in Italy on Euro area membership, potentially breaking apart the currency union and catalyzing a global risk meltdown. Later in the same week, Spain’s no-confidence vote against their prime minister and President Trump’s about-face on trade policy with the European Union further damaged sentiment. Global stocks plummeted with Italian stocks leading the way down, before bouncing a bit towards the end of the week as it became clear that Italian politicians would find a compromise that would prevent elections. For reasons we first laid out in our Weekly View on Italy back in January, we believe that European political issues, while troubling, are unlikely to cause the dissolution of the Eurozone in the near-to-intermediate term. Portugal experience in 2015-16 suggests resolution without Euro exit, even with a Euroskeptic government: Thus far the 2018 Italian saga has looked a lot like the 2015-16 Portugal issue in our opinion: both areas had similar bond spreads at the time, both have experienced rapid rises in those as government formation was lengthy and complicated, and both had ‘Euroskeptic’ parties offically take power. In the end, Portuguese stocks found a floor not long after a Euroskeptic government was officially formed….and the Portuguese government, like the Greek populist government before them in 2013, found a way to work within the construct of the Eurozone. Italians generally want to stay in the Eurozone: Lost in the recent headlines is the fact that the Italian populace have generally stayed favorable on the idea of EU membership, according to polls taken last fall. 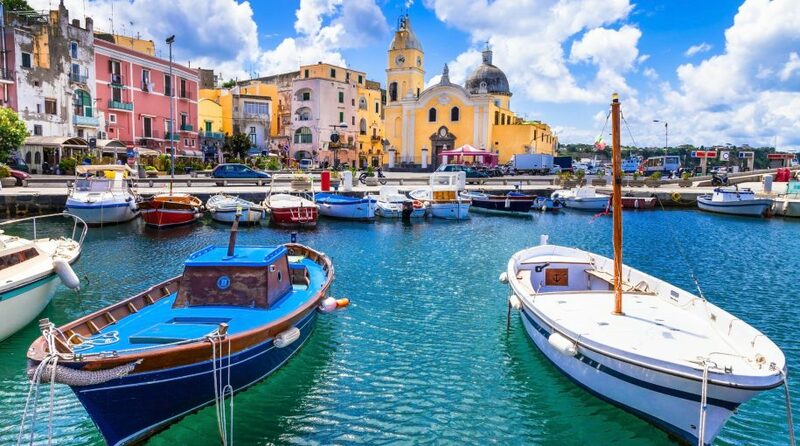 Similar to Greece in 2013 and Portugal in 2015, it’s highly likely that whichever government ends up consolidating power in Italy, they will likely be forced to submit to the will of the people with regards to Eurozone membership. This week is just ‘par for the course’ for Italian politics: Italy has had well over 60 governments in ~70 years of democratic rule. Italy’s convoluted election statutes make it difficult for political parties to establish clear mandates. While this has clearly cost Italy in terms of growth and productivity throughout the years, the country generally finds a way to muddle through, often in ways that seem incomprehensible to Americans. Last week’s action, whereby Italy’s fringe parties found a last-minute compromise pick for economic minister to stave off government collapse, is a classic example, in our opinion. ECB – likely more dovish now: The recent spike in periphery bond yields and credit default swaps (CDS) alongside the moderation of Eurozone economic growth cannot go unnoticed by the ECB. We suspect these events may at the margin steer the ECB in a more dovish direction, which should provide a floor for European risk assets at a much higher level than in the distressing days of 2011-12. After the weakness last week, Italian large-cap stocks as represented by MSCI Italy now trade at under 12 times next years’ expected earnings and 0.7x sales, both below long-term averages. This is despite an overall dividend yield of over 4% and analyst consensus estimates still suggesting strong double-digit earnings-per-share growth in 2018, following 25%+ earnings growth in 2017 (data source: Thomson Reuters, I/B/E/S). In comparison to larger region stock indices such as the U.S., MSCI Italy is an index with relatively few companies, and its market-weighted construction creates a fairly concentrated exposure; the top ten stock holdings in MSCI Italy make up collectively over 70% of the entire index market capitalization (source: Factset Data Systems). As such, engaging in qualitative ‘bottom-up’ company analysis of these large holdings can yield important insight into the entire index, in our opinion. We found among the largest holdings in MSCI Italy a compelling mixture of financial companies with improving fundamentals, established brands with global reach, and a high quality utility with strong cash flow generation. We don’t deny that the Italian banking system still contains risks, particularly among smaller banks, and that regional politics may remain a headline risk as well as a potential drag on the health of the Italian economy for the foreseeable future. However, we believe the recent weakness in the shares takes this into account and that patient, contrarian investors in Italy will be rewarded. Riverfront’s tactical process suggested taking down risk in our 7 to 10-year time horizon portfolios (Dynamic Equity Income and Global Allocation), commesurate with risk action already taken a few weeks ago in our more conservative portfolios. We chose to lower risk by selling broad hedged and non-currency hedged developed international equities, as our models suggested the near-term returns were no better than neutral for the next 3 months. We chose to replace a portion of that broad international exposure in most of our asset allocation portfolios with much more specific exposure to Italian large-cap stocks, as well as Japanese small-cap stocks (for more on Japanese stocks, please see our recently published Strategic View from 05/29/18, entitled “Japan May Once Again Be the Land of the Rising Sun”). Our relatively small purchase of Italian stocks recognizes that we may be early as we continue to monitor stock sentiment around Italy.